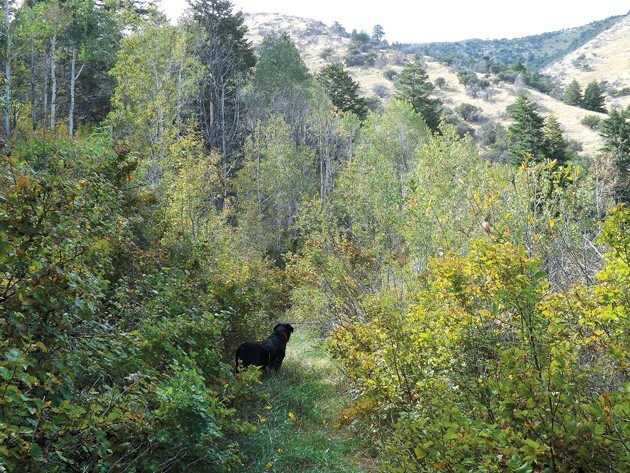 The writer’s dog, Duke, walks ahead on a forest trail in Miners Canyon. 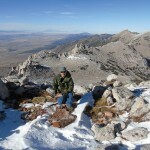 There are some places in Tooele County that have little to no outdoor qualities of value. Some, in fact, are downright forgettable. Yet, in most cases, the blighted areas are gateways to more pleasing terrain. If you just keep an open mind while passing through, you often end up at places that many people ignore because they wrote them off based on initial impressions. One such place is called Miners Canyon. It is due west of Grantsville in the Stansbury Mountains. To get there, follow SR-138 west through Grantsville, past the Walmart Distribution Center on the west side of town and about a mile later, just before the road begins to bend slightly to the right, you will notice a low mountain with some antennas on top of it on the left hand side of the road. 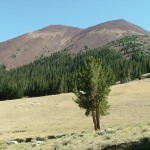 This hill is called “Little Mountain” on the “Flux” USGS 1:24000 map. 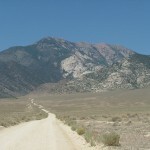 A good gravel road breaks off of the highway and heads toward the base of the mountains just north of Little Mountain. Turn left onto the gravel road and follow it for approximately two miles as it curls around Little Mountain to the south and ends in some old limestone quarries. 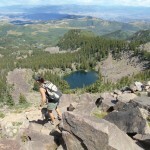 Pass through the quarries on the main track and then continue west across the ravine to the foot of the mountains. At this point you must turn left or right. Turn right and stay on the rough dirt road as it follows the contour of the foothills and bends around to the left and west. After a while you will notice a well-defined, but rough and rocky road break off to the left towards a notch in the hills. This is the Miners Canyon Road. Turn left and park your vehicle where you feel comfortable, because unless you have a major 4×4 that you want to test, this is the end of the line. Continue on foot and the path isn’t hard to follow. The road was well built back in the day and ATV riders use it often. At first glance the mouth of Miners Canyon is a homely place. The area has been devastated by range fires and only bleached skeletons of burned junipers remain on the hills. The area is also rocky and there are spider webs in the rocks and snake holes in the ground. You are likely to discover a scorpion or two. The only redeeming values of the area are the views of Stansbury Island in the Great Salt Lake and the sunflowers that cover the landscape every September. Ignore this unsightly area and walk on through. As you enter the canyon, you may notice on a point to the south an old tower, which indicates you are entering the correct canyon. The initial walk up the canyon is forgettable, but the prospects of the place improve greatly after about 1.6 miles from the canyon mouth where the old mining road forks. The left fork disappears into dense woods while the right fork road hugs the base of the mountain on the north side of the canyon and remains in the open, passing through another patch of burned trees. These two roads end up at the same place after approximately a half mile, but one of the routes is clearly more enjoyable and interesting than the other. I always take the left fork. Even though a low canopy of trees, shrubs and bushes will make you duck in a few places, the road is good and easy to follow. Watch out for tent caterpillar nests and spider webs across the path. Along this stretch you will encounter the first stands of mixed Douglas fir and white fir and large elderberry bushes that are weighed down with heavy clumps of the blue elderberries later in the season. This hidden forest trail takes you past an old mine adit that caved in long ago, but has a significant tailings dump, a few old exposed mine timbers and some old bent-up ore car tracks. In the heavy foliage, I could make out the remains of a few shacks, but the forest growth was so thick I didn’t explore those ruins much further. The trail continues west into increasingly nicer terrain where tall grass, aspen and large conifers grow. The road emerges at a place where an old line shack once stood. The buildings unfortunately have collapsed and only concrete foundations and piles of boards remain. The elevation here is 6,500 feet, which for reference is several hundred feet higher than Johnson’s or Lookout passes. The canyon bottom forest is a far cry from the wastes you walked through at the beginning of the hike. But if you hadn’t kept on going, you would never have known this area existed as it is completely indiscernible from the canyon mouth or valley. Midway up Miners Canyon where the old shack is located, is an area of deep side canyons and steep slopes. This forest area is even more special here because it is a small enclave of green that escaped the destructive Big Pole Fire that charred much of the northern portion of the range several years ago. The distance from the canyon mouth to the ruins and the pocket forest is roughly two miles. It is a pleasant place in the springtime and in fall when the aspen leaves change. Even in the hottest months of summer, if you make it up to this area, the trees provide relief from the heat and the area makes for a good picnic spot. I have noticed hawks and heard owls hoot in the evenings here. I also encounter several mule deer in this area each time I visit. You can end your hike here or you can continue several directions for considerable distances. Whatever you decide, ensure you take plenty of water because Miners Canyon is a dry canyon in any season. This is rough and rocky country where your cell signal will be cut off down in the canyon bottoms. Conduct a thorough map reconnaissance and don’t exceed your hiking capability, as the road’s rocky surface will wear on your feet. In next week’s article, I will describe the route beyond the old mining camp to the top of the high plateau known as “Timpie” that makes up the summit of the range in this area. We’ll also discuss some of the historic mining activity that occurred, from which the canyon derived its name. Maps: “Flux” & “Timpie” USGS 1:24,000 Quads.